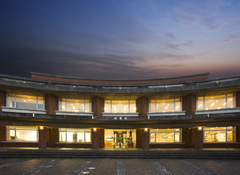 University of Shizuoka Library consists of 2 campus libraries. 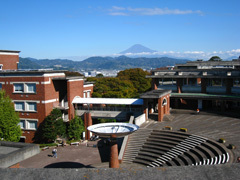 Kusanagi Library stands at the upper end of Kusanagi Campus, with marvelous views of Mt. Fuji and the City of Shizuoka. It is a semicircular brick building, three stories above and one story below ground. It has a total floor space of 5,996 square meters (over 63,000 square feet) and plays an important academic role as a reference library. Oshika Library is located on the second floor of the Administration Building of Oshika Campus.